These two documents are the official risk assessment tools used in the U.S. to assist beef cattle producers identify and rectify management practices that allow transmission of Johne’s disease in cattle herds. These forms can be used unofficially by producers to gauge their herd management as it relates to Johne’s disease prevention and control. These same forms are used by Johne’s Certified Veterinarians to perform official herd risk assessments and generate herd plans. These forms are filed with the appropriate state Designated Johne’s Coordinator (DJC). If approved by the DJC, the herd is considered enrolled in the U.S. national Johne’s program. These risk assessment forms have been converted into an App for iPads making the process of assessing beef cattle herds quick, easy and paperless. 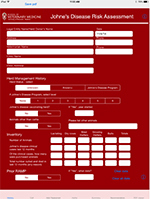 This link leads you to the Johne’s Risk Assessment and Management Plan (RAMP) App information. At the top of the first page (pictured to the left) the user selects dairy or beef and then proceeds with the RAMP specific to their type of cattle. 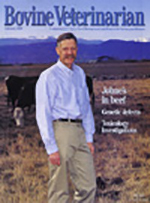 Geni Wren, Bovine Veterinarian, February 2000. Results of the USDA survey of U.S. cow-calf operations for Johne’s disease are described with interpretation and comments by one of the study organizers, Dr. Dave Dargatz. Beef ’97, the name of the survey, found that 7.9% of U.S. cow-calf herds (called beef suckler herds in some countries) have at least one cow with Johne’s disease. An excellent inset article describes how to control Johne’s disease in beef herds. Information for this inset was provided by Drs. Christine Rossiter and Don Hansen of the National Johne’s Working Group. Click here to download this 4 page 281 KB pdf document. Brad Parker, Angus Journal, August 2001. 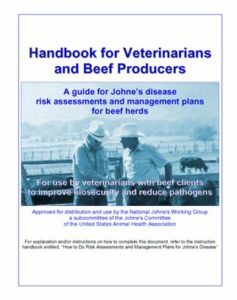 This article directed at beef breeders describes Johne’s disease in general and give specific examples of beef breeders who are tackling working hard to insure their herd is not MAP-infected and certified in the US Voluntary Program (see above). The herd owners described in this article are using their certified status to market their cattle. Click here to download this 3 page 270 KB pdf document. Brad Parker, Angus Journal, September 2001. This article, the second in a series, describes diagnostic tests for Johne’s disease. It gives the advantages and disadvantages of different types of tests available today and a scheme for making decisions when using the ELISA. The article also gives a glimpse of what new tests are under development in research laboratories. Click here to download this 3 page 245 KB pdf document. Brad Parker, Angus Journal, October 2001. Johne’s disease prevention and control are the theme of this, the third article in a series published in the Angus Journal. Strategies to avoid bringing M. paratuberculosis (MAP) into a beef herd are outlined. For herd owners that discover their herd is infected, the article describes management and testing strategies to get on top of this disease. Click here to download this 3 page, 247 KB pdf document. Johne's disease is more common than beef cattle producers realize. The articles on this page provide resources to help understand and deal with this infectious disease.